Sure, you know Northwestern is in Evanston, but how much do you really know about the city? Who lives here? What do they care about? How does the city work? Get to know Evanston by diving into open data about the city and sharing what you find with others. Put your data analysis, visualization, and communication skills to good use by working with real data about your community. Create a project to share with others, and have a chance to win a $500 gift card! Staff from the City of Evanston Open Data group will be involved in the judging and looking for opportunities to collaborate with participants! 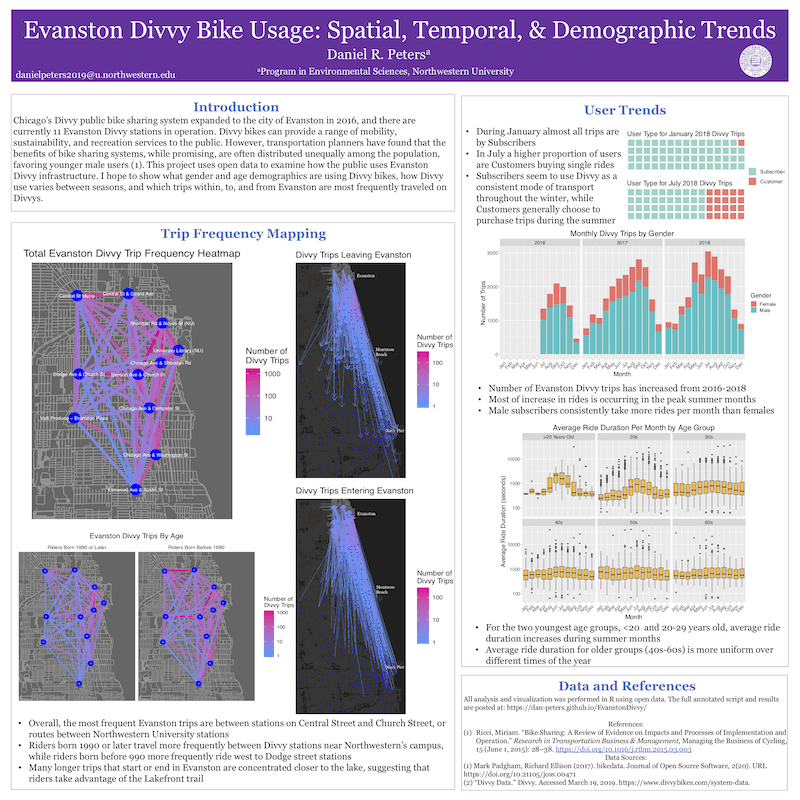 Using open, publicly available data about Evanston, such as Open Data from the City of Evanston, or US Census data on the city, create a poster that tells a data-driven story or provides insight about the city. All Northwestern University students, both undergraduate and graduate, enrolled as of February 11, 2019 are eligible to participate. Produce a poster with your data analysis and visualizations. The posters will be displayed in Mudd Library for judging. Be physically printed (or drawn) and measure no more than 36″ on each side. You can use the library printers or any other service you like. Include source information for any data used. Data citation help. Be self-contained and include all information someone needs to understand your analysis and/or visualization. You will not be present when your poster is judged. Share the details of your analysis by including a URL linking to the code you used to produce the analysis and visualizations. If you didn’t write code, link to a description of the tools and methods you used. The code or description does not need to reproduce all styling and formatting, just the core findings and raw visualizations. We recommend you use GitHub, Bitbucket, or another code sharing site, but links to Google Drive, Box, Dropbox, or other services are acceptable as well. Consider shortening the URL with a service such as bitly.com or goo.gl. More than one person may contribute to a single entry. The names of all contributors should be listed. A single prize will be awarded to the winning entry. Design the text and graphics to be legible to someone viewing your poster from 3-5 feet away. Posters can contain whatever combination of text, tables, and graphics you need to tell your data story. There is no prescribed format for the poster; it does not need to be an academic-style poster. Judges must be able to reproduce the analysis and visualizations included on the poster from the details provided in your URL. You may incorporate additional data as appropriate, but all data used must be available to all Northwestern students (public data or Northwestern licensed data) and cited on the poster. Open data (publicly available data) about the City of Evanston must be a central piece of the project. All analysis and visualizations must be your own original work. It’s OK if the analysis has been or will be submitted in fulfillment of coursework or used in a publication or other application. If you use someone else’s code in your analysis, the source must be acknowledged in your code. More complex analysis methods don’t necessarily improve the analysis and will not score you more points in the judging. Use the methods that are appropriate for your data and the story you’re telling. Remember, sometimes all you need to do is count the right things to tell an interesting story. Each student may only submit one entry, either as an individual or as part of a team. Poster conveys a clear story or insight and uses data to back up the main point. The analysis is creative and interesting. Analysis and visualizations used are appropriate for the data. Analysis and visualizations are accurate and faithfully represent the data. Open data about the City of Evanston is a central part of the analysis. Explanations are clear and correct. Analysis can be reproduced easily with the provided information. Text clearly communicates the message of the poster and is free of spelling and grammatical errors. Poster makes a visual impact and is engaging. Graphics and text are at an appropriate scale. All required poster elements are present (e.g. data citation, link to code, title, name). Layout of the poster is easy to follow and well organized. Visualizations, graphics, and tables are appropriately labelled. Judging scores or feedback on the entries will not be provided to participants. Judges will consist of staff from the sponsoring organizations and the City of Evanston. Fill out the Submission Form. You will need to provide your poster’s title, information about the data and software used, and a link to your code. You can optionally upload a file or image of your poster. Deliver the physical poster to one of the drop-offs listed below. Hand your poster to a staff member at the desk and make sure to add your name to the check-in list they hand you. If you have someone else deliver your poster, make sure they put your name on the check-in list. The online form must be submitted, and the physical poster must be delivered by Monday, April 1, 2019, 3pm. Posters will be hung in Mudd Library for judging through April 5th. Participants may take down their posters starting on April 6th. Any posters not removed by April 12th at noon will be discarded. The winning entry will receive a $500 gift card. The winner will be notified on Friday, April 5, 2019. Look for an announcement about the winner on the NUIT-Research listserv. Staff from the City of Evanston Open Data group will also be looking for ways to collaborate with participants and share analysis and visualizations using the Evanston Open Data with the community. Questions about the rules or contest should be directed to Christina Maimone, Research Data Services Lead, Northwestern IT Research Computing Services.